Almost every internet user has a Google account. I assume that you have one too. If you don't have one, first, create a new google account. Then, visit google recaptcha, click GET RECAPTCHA button (the button in the top right corner in below image) and sign in with your Google account. In the form, add any label you like. Then, select reCAPTCHA v2 and add your domains. Here, you can even add a fake domain which you use in your localhost and it will function very well. Next, find your site key and secret key. The JS code will be like following. The sendAjaxRequset() function is called when the button in the HTML page is clicked. grecaptcha is the global object defined by recaptcha as the handler. In the sendAjaxRequest() function, if grecaptcha object is not loaded, it will alert an error message and return from the function. Next, we get the response and do a simple validation on it. It will alert an error message if the response is empty. Next, we send a POST Ajax request to validate-recaptcha.php with the recaptcha response. In this step, we will create validate-recaptcha.php to validate our recaptcha response. 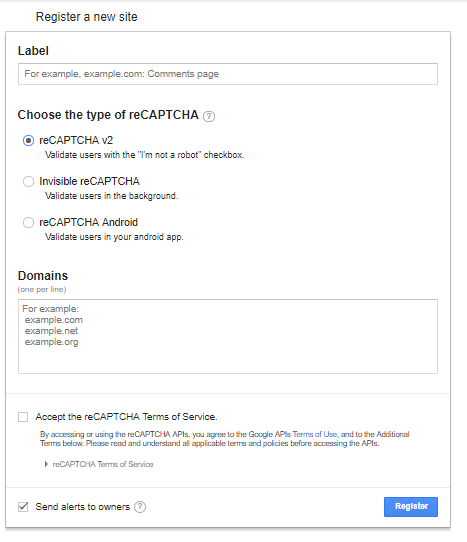 First, we check whether the recaptcha POST variable is set. Next, we save the recaptcha response in $response. Next, we create a http query with http_build_query() function. This includes the response, secret key of your site (Mind to change this with your secret key) and the IP address of the remote user. Then, we create the steam, send the request to the server and save the response in $serverResponse variable. This response is JSON encoded. So, we use json_decode() function to decode it. Then, we save the result in $result variable. If $result -> success is true, recaptcha is true. That's all. Not so hard right? If you get any problem in creating your own function, let me know by commenting below. I'm here to help you always. I hope you enjoyed the article. Thank you for reading. How to use "WHERE IN" in MYSQLi Prepared Statements in PHP?